It's an outdoor activity playground - Get out your office and do something outdoors! Because the economy needs it! They already speak English- Well chances are you may not fully understand the dialect but at least its english! Excellent Food- Food is definitely quality over quantity here. You may not find many 'you can eat buffets' here, but boy the quality is outstanding! Because you may never get the same opportunity: You never know whats going to happen in these crazy economic times. Come now and enjoy! 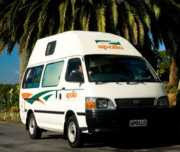 Book any Escape Rentals vehicle for travel between 1st April - 30th April 2009 and receive a 15% off our already low rates from Christchurch or Auckland. Pay for 2 weeks and get up to 7 free days. Applies to Motorhome hire. This coupon is available for booking made before 31 July 2009. Travel must be made between 1st April 2009 and 15th September 2009. Drop offs may be made after 15th September but free days will only apply to days that fall inside of the travel period above. Rent a Pacific Horizon vehicle for 10 to 15 days between 1st April and 30th September 2009 and you will get 2 of those days for free! Booking must be made by 25 September 2009. Minimum booking period is 10 days. Book any Envrio Premium Vehicle by 30th June 2009 and get between 5 - 10% off the normal base rental rate for travel between 1st May to 15th September 2009. This offer is not available for Wellington depot.